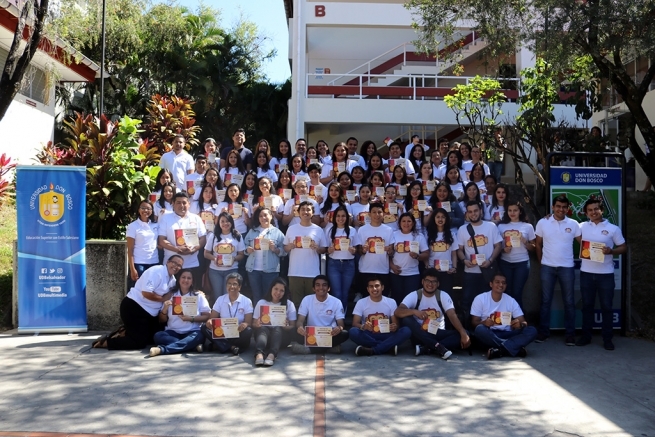 (MissionNewswire) The first group of graduates, 87 people in all, completed the first American Sign Language (ASL) course offered at Don Bosco University in El Salvador. The course is a part of the Without Barriers initiative launched by the Association of Salesian Students for Thought and Civic Education (AESPEC) and the Salesian Association of Students of Aeronautics (ASEA) at the University of Don Bosco. Without Barriers promotes the social integration of students with a hearing impairment within the university. The first step of the initiative was to develop a course in ASL. This course is made available to the entire university population, including students, teachers and staff. “The new Without Barriers initiative aims to bring ASL courses together with conferences and debates to bring a level of sensitivity and awareness of the problems those who are hearing impaired not only face in the field of education, but also in the labor market and in social reality,” said Mariely Rodriguez, president of AESPEC. According to the representatives from both Salesian associations, there are students with hearing impairments attending Don Bosco University who sometimes cannot count on someone to help them communicate with other people, and so it is difficult for them to engage in certain activities inside the school’s campus. The goal of the initiative is to work toward greater inclusion of all students so that they are able to participate fully and engage in campus life. Edwin Campos is among the first graduates of the program. As a child he gradually lost his hearing after taking medication caused a complication. After learning about the Without Barriers, he decided to enroll. Because of the ASL course, by 2018 Campos will make his dream come true to study at the Don Bosco Institute, a Salesian institution that will grant him a full scholarship to attend its three-year course in automotive mechanics. Students connected to the project will accompany Edwin during his educational process, supporting him and the school teachers. “We have committed ourselves to the Don Bosco Institute to help translate for Edwin. As a project, we have chosen to create a mentoring program for him. For example, some third-level students helped Edwin in the translation of messages during the course’s introductory session,” said Rodríguez. During the graduation, another honor was awarded to Professor Julio Aceituno, who is also engaged in the Without Barriers project. He is the first deaf person in the country to graduate in electrical engineering. Dr. Aceituno studied at the Don Bosco University and recently received the title that accredits him as a professional in the field. El Salvador is one of the most violent countries in Central America, along with Honduras and Guatemala. The murder rate in El Salvador rose more than 44 percent in the beginning months of 2014 when compared to the same time in 2013. Gang violence is a leading cause of violence in the country and it’s estimated that some 60,000 young people have gang affiliation. Gang involvement often offers a sense of belonging and family that counters the lack of education and employment opportunities offered in the country.